Essential Question: How do colors relate and interact with each other, the environment and the viewer? Use color within artwork to communicate meaning. 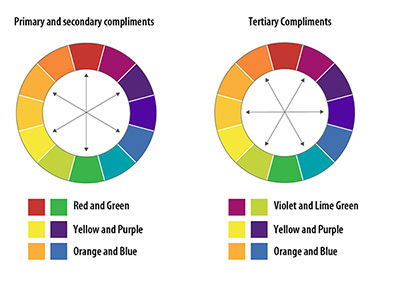 Understand how different cultures interpret the meanings of different colors. Color is a visual response to light reflected from a surface; it is sometimes perceived as a characteristic of that surface. Pigment, on the other hand, is a physical substance, usually a powder, that is mixed with a liquid to create color. Experimenting with the physical properties of a color (hue, value, and intensity) produces a wide range of colors. Colors can be used to create an emotional response in the viewer, a fact that the artist exploits when using color in symbolic ways or in harmonious/discordant combinations. Color may be used to enhance the other elements. It can set a mood, attract attention, be used decoratively or symbolically; it can make objects look heavy or light, warm or cool; it can advance or recede; it can be transparent or opaque. Color plays a significant part in unity, variety, harmony, emphasis, and contrast in a work of art. Please write the color terms and definitions in your sketchbook. You only need to include the bolded words. e.g., red, yellow, blue, green. Primary colors: The three hues which cannot be produced by a mixture of other hues. Theoretically, all other colors (except black and white) are developed from the primary colors. Secondary Color: Created by mixing any two of the primary colors. Red and yellow combine to create orange, yellow and blue to create green, and red and blue to create violet. Tertiary colors (Intermediate): Derived by mixing a secondary color with one of its primary colors; e.g., blue-green or yellow-orange. Value: The lightness or darkness of a color; e.g., pink and maroon are values of red. The value of a color can be altered by the addition of white or black. A tint is produced by the addition of white to a hue. A shade is produced by the addition of black to a hue. Intensity: The degree of brightness or vividness of a hue, such as red, can be made less intense, or duller, by greying it with the complement (in this case green) of that color. 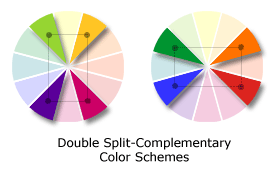 ​Split Complementary: a complementary color plus the two colors on either side of its complement on the color wheel. Monochromatic: various values and intensities of one hue. ​Cool colors: generally those containing blue. A tint of a color is created by adding white. A shade by adding black. A tone is created by adding grey. Go easy on the saturation… use it to help tell your story or guide the viewers to what’s important. Pick the color harmony that best suits what you want to achieve (calmness, playfulness, suspense). Study the classics, coz they knew what they were doing. ArtRenewal.org has hundreds of historic paintings which you can view for free. Experiment! The best way to get better is to just dive in. Don’t get stressed if you fail miserably the first few times.